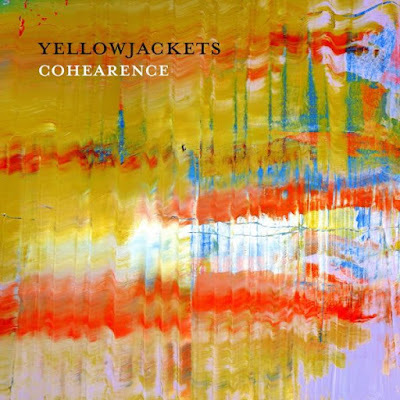 The latest CD from the long-running fusion-esque Yellowjackets shows a great mix of styles and sounds, less reliance on special guests than in the recent past, and marvellous musicianship. Formed 35 years ago as a post-Weather Report fusion band, Yellowjackets have shown remarkable staying power. Driven by founders keyboardist Russell Ferrante and drummer Will Kennedy, the music strongly features the tenor sax of Bob Minzter (a member for just 25 years, and familiar to many students through his series of sax study books), backed up by the bass guitar of Australian-born newcomer Dane Alderson. This latest collection foregoes featuring a special guest (Mike Stern, Robben Ford and Ambrose Akinmusire have all featured on Jackets CDs in the past decade) in favour of a focus on the group’s internal capacity for composition and performance. This collection of work was well worked on the road before the band went into the studio – most of the tunes featured at Yellowjackets dates at Ronnie Scott’s in the summer of 2015. This was a deliberate ploy to explore the music more fully rather than record a first impression (as sometimes happens with new material). It has paid off – the band sound at ease with the tunes and with each other, and the twists and turns sound very natural and well-sculpted. The album title, Cohearence, stems from this visit to London when Ferrante and Mintzer visited the Tate Modern and saw Gerhard Richter’s six-painting cycle of abstract work entitled Cage – Six Paintings, referencing avant-gardist John Cage and described as ‘a coherent group.’ Ferrante started thinking about coherence and connected it to the band’s joint work and camaraderie. The album starts on fairly safe fusion territory with Ferrante’s tune Golden State, inspired by the bustle of the I-5 freeway in California. Piano triplets give an insistent background which opens up into solo space for Mintzer, almost like seeing the big desert backgrounds before driving back into the next city and rumbling pulses once more. Mintzer’s tune Guarded Optimism follows, with a skipping tenor/synth lead line over deceptively slow-moving bass line which then explodes into high-speed swinging soloing. Mintzer also contributes a fine 6/8 groove on Inevitable Outcome, giving himself the chance to use an EWI wind controller to jockey with Ferrante’s synth. The album moves further from fusion territory as it progresses. Trane Changing offers a reharmonisation of Coltrane’s Giant Steps with a fine bass guitar solo from Alderson, while Eddie’s In The House turns funky in a fulsome way. Child’s Play (another Mintzer tune) is a delightful romp which definitely put a spring in my step walking towards the Tube station. A standout is the one non-original on the album, a stately and measured take on traditional American folk song Shenandoah with majestic simplicity offering a lovely contrast to the complexities which have preceded it. Yellowjackets have succeeded in their goal of assembling a coherent collection of harmonious statements. While the studio recording is faultless (of course), for me it doesn’t quite reflect the power of seeing this music performed live by absolutely top-class musicians at the peak of their game. An opportunity to do just that is just around the corner: they are back at Ronnie’s on 15/16 July 2016.